-11 holds the edge of the area for rebounds and attempted clearances. 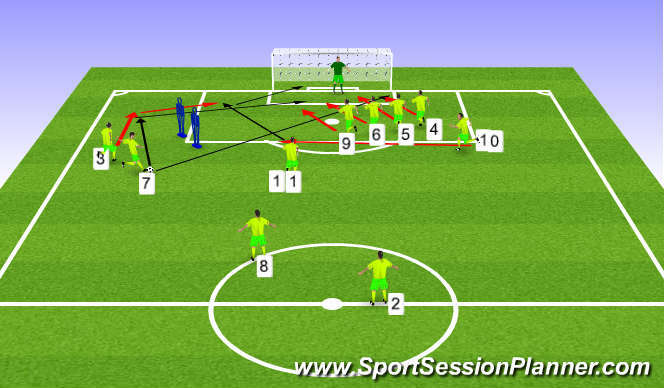 -There are two main options that should result in a direct shot on goal or a low cross across the edge of the 6 yrd box. If these options are closed down players need to be aware enough to stop and choose another free-kick routine. Player 10 makes an early run lateral run across the edge of the box. Ideally this player should be left footed for a free-kick from the left hand side of the field. If open from the pass from 7 this player can shoot directly on goal. if this player is closed down then he can play an angled pass to player three who can time his run and shoot at goal.